The 2017 Academic Symposium for Palliative Care Education and Research, being conducted Sept. 28 -29 on the CSU San Marcos campus is featuring as one of four keynote addresses, “Palliative Care and LGBTQ Persons: Countering Stigma and Nurturing Resilience,” co-presented by Kimberly D. Acquaviva, PhD, MSW, CSE, Associate Professor, The George Washington University School of Nursing and Brian de Vries, Ph.D., Professor in the Gerontology Program at San Francisco State University. Both of these distinguished faculty have inspiring interdisciplinary and collaborative scholarly endeavors. Dr. Acquaviva is a tenured faculty member at the George Washington University School of Nursing. She is both a founding faculty at that school, and is the first non-nurse to receive tenure in the school. As a social worker teaching within a school of nursing, her scholarship is interdisciplinary and collaborative. Her scholarly work focuses on LGBTQ aging and end-of-life issues, and her clinical work has been with patients and families facing life-limiting illnesses in both hospital and hospice settings. Nationally known as an innovator and authority on lesbian, gay, bisexual, transgender, gender non-conforming, queer, and/or questioning (LGBTQ) aging and end-of-life issues, Acquaviva has chaired efforts for the American Society on Aging’s LGBT Aging Issues Network (LAIN), and served as one of four LGBT aging researchers responsible for overseeing the development, implementation and analysis of Still Out, Still Aging: The MetLife Study of Lesbian, Gay, Bisexual, and Transgender Baby Boomers, a national survey of 1200 lesbian, gay, bisexual and transgender baby boomers and 1,200 of their heterosexual counterparts. Dr. Acquaviva developed the content, script and storyboards for “Aging and End-of-Life Issues in the LGBT Community” for the Hospice Foundation of America’s Centers for Medicare and Medicaid Services (CMS)-funded online course as part of a national education/outreach initiative on hospice care. She serves on the editorial boards of several refereed journals including Sexuality Research and Social Policy, Journal of Gay and Lesbian Social Services, and Journal of Ethnographic & Qualitative Research. Dr. Acquaviva is active in the development of technology-facilitated educational innovations, in national-level policy and advocacy work, and in community voluntary positions. 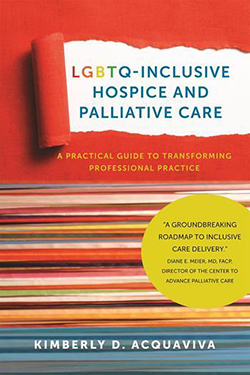 In 2017, Dr. Acquaviva’s groundbreaking book, LGBTQ-Inclusive Hospice & Palliative Care: A Practical Guide to Transforming Professional Practice, was published by Harrington Park Press and distributed by Columbia University Press. Dr. Acquaviva’s goal was to give providers in hospice and palliative care — physicians, nurse practitioners, registered nurses, social workers, counselors, and chaplains — ways in which they can transform their practices so they’re comprehensively LGBTQ-inclusive. Dr. Acquaviva designed and included tools in the publication for programs or providers to self-reflect on their policies and practices so they can “transform care for all the patients and families” they serve. In this same spirit, Dr. Acquaviva will share with Symposium attendees the specific strategies they can incorporate into their curricula to ensure that future palliative care professionals have knowledge and tools they can use to meet the needs of LGBTQ patients and families.